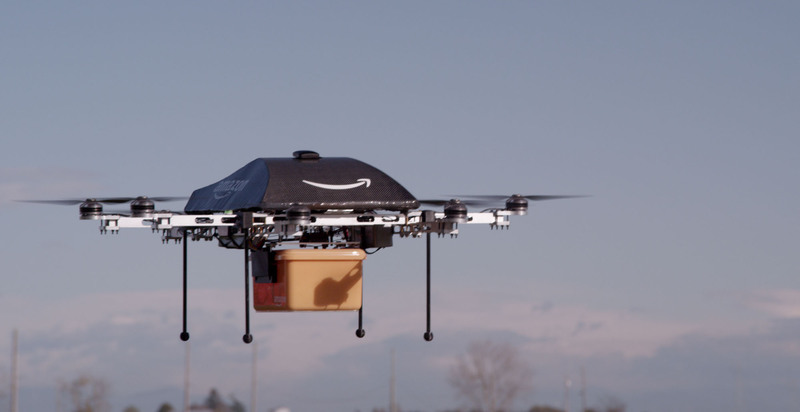 The future is bright, the future is a drone delivering Amazon packages to your door. Amazon is trying out delivering packages using unmanned drones called Octocopters (no relation to Octomom), founder Jeff Bezos said on CBS programme ‘60 Minutes’ on Sunday. The craft, which looks like a barbecue with propellers, could deliver packages weighing up to five pounds (2.3kg), which make up 86% of Amazon orders, Bezos said. The ‘Prime Air’ service is being designed to deliver items within a 10-mile radius of distribution centres in half an hour or less. Civilian airspace is yet to be opened up to unmanned drones, but could be populated with Amazon’s flying spiders by 2015 in the US and 2016 in Europe. Dr Darren Ansell, an expert on unmanned aerial vehicles (UAVs) at the University of Central Lancashire, pointed out some pretty obvious potential flaws in Amazon’s plan to the BBC: ‘With no one to guard them the aircraft and package could be captured and stolen,’ Ansell said. ‘The UAVs do not currently have the awareness of their environment to be able to avoid flying into people,’ Ansell added. And birds. Won’t somebody please think of the birds?